In the last article Clash of Titans – Microsoft and SAP weigh in of this little series, I discussed the strategy of two of the big four and how they are positioned in the platform play of the business software titans – and others. All these business software vendors are competing in a market that is changing – commoditizing – at a fast rate towards an experience market, and probably beyond, if I follow the argumentation and thoughs of CRM godfather and friend Paul Greenberg. Business application vendors can stay really successful only if they morph into platform players. 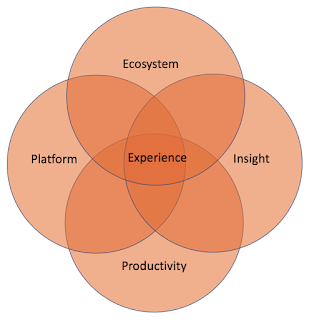 And this platform is more than just a technology platform, but encompasses four dimensions. In this article I look at Oracle and Salesforce and how they position themselves in this game of thrones. But now, without further ado, let’s dig into the topic. Since the launch of what originally was project Fusion and now is Oracle CX, the company has done a remarkable pivot from being an on premise company to becoming a cloud company. The company has its strength in being a full stack provider with a full range of business applications. However, its main strenght is owning the gold standard database engine that runs the majority of business workloads worldwide. From its overall technological profile one could position Oracle somewhere between SAP and Microsoft as it with Open Office also owns a full fledged office suite that helps on the productivity side. However, Oracle is not a public cloud IaaS player although, at its core, it is rather a technology company than a business software company. The main purpose of the Oracle cloud is running Oracle applications, and running them efficiently. And to further reduce the resulting risk of customers defecting to other vendors Oracle introduced its Cloud at Customer back in 2016, which was actually a pretty good idea. This is also evidenced by Microsoft copying it with the Azure Stack. Ecosystem-wise, Oracle appears to be trailing Microsoft, Salesforce, and SAP. While the company owns significant assets that have their roots in the open source community, like Java, or Open Office, Oracle does not have the reputation of being much of an ecosystem player, but more of a kind of bully. Still, Oracle has a good number of implementation partners. Insight is one thing where Oracle has strengths. For one there is a full stack of business applications that are capable of delivering a lot of important data into Oracle’s machine learning algorithms. But there is more. Especially since the introduction of the Autonomous Oracle Database Service. This service promises to bring down cost, while increasing performance and delivering unprecedented scalability and security. And it delivers data that can be used for improving one of the most worrisome challenges: It delivers the insight on security problems and is capable of acting on it. This is a value proposition that currently none of the other vendors can claim to have. Although it is only a temporary advantage, as so frequently in this business. Oracle owns a good number of productivity tools, namely the above mentioned Open Office. It has also intelligence built into the business applications – and the administration layers – that increase staff productivity. So, they are playing fairly well in this dimension, too. In my eyes Oracle should work on becoming more approachable, and getting rid of the image of being a bully. Improving on the ecosystem frontier while using the great database asset that the company has could make it an even more formidable player than it already is. Oh, yeah, and do not set your sights too much on AWS. Microsoft is your real opponent. Salesforce surely is the current synonym for CRM software, and this not only because the company wisely chose this acronym as its stock ticker symbol. Evolving from its origins the company has evolved its portfolio into a wide variety of customer facing applications. The company also has realized long ago that business applications will get commoditized and that there consequently is a need for a platform, which can get used by its vast ecosystem of ISV’s and implementation partners. The platform that helped Salesforce starting their ecosystem is Force.com and, in combination with being an ecosystem player at its heart it was able to create one that is probably rivalled only by Microsoft’s. Salesforce’s Trailhead education platform is even better than what Microsoft offers. 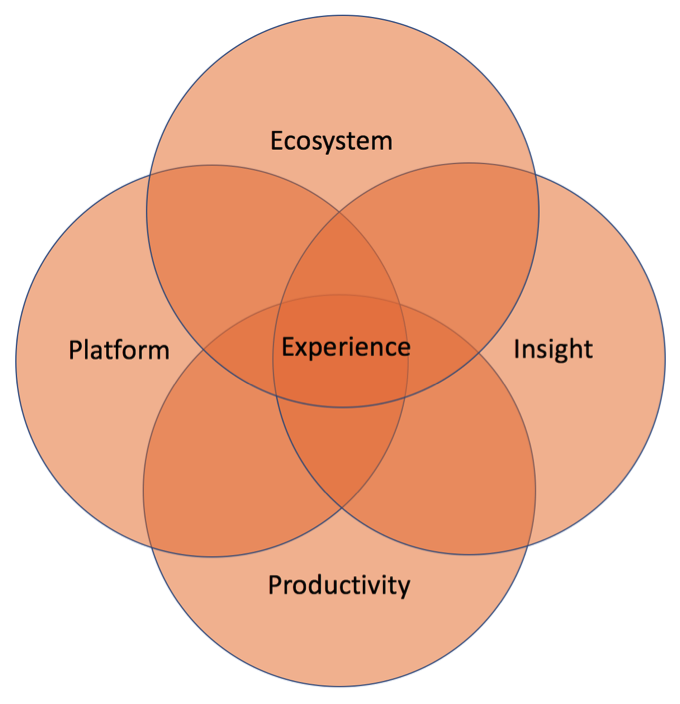 While the technical platform is (mostly) limited to customer facing applications, which also has a challenge on the data side, discussed below, the thriving ecosystem is Salesforce’s biggest asset. The combination of ecosystem and relentless focus on customer facing applications resulted in Salesforce taking an undisputed leadership position in the wider CRM market. Well, a strong sales strategy and execution helped to get there, too; still helps. However, as mentioned above, the company’s focus on CRM-like applications and then e-commerce results in limited access to data. And data is the raw material for insight – which is actionable information. From an insight angle, Salesforce has created its Einstein layer, which is embedded into the applications. Embedded intelligence is what can create immediate value for business users. It provides predictive analytics and recommendations, sometimes even prescriptions to users and/or takes away tedious tasks. And this is exactly where Salesforce’s data challenge lies. Salesforce has a lot of customer and order data, but none of supply chains or relations outside a company realm. This is where Oracle, SAP, and especially Microsoft have an edge. This was also an important reason for Salesforce attempting to acquire LinkedIn and looking at acquiring Twitter. The company finally acquired Mulesoft, which can alleviate the data weakness to some extent, while also serving as an improved glue between Salesforce owned applications and Salesforce to non Salesforce integrations. Mulesoft connects processes and therefore gives access to business data which it can also feed into Einstein’s machine learning capabilities. The main productivity tools that Salesforce offers, are Chatter, the embedded analytics applications including the Salesforce Inbox and the Lightning UI. With these the company covers business productivity but still trails the ability that e.g. Microsoft can offer with the office suite of products. In summary, Salesforce is a formidable player. Right now, no competitor can afford ignoring them in the wider CRM area. It, however, is not all hunkydory in downtown San Francisco. The company is in need of getting more access to data and better access to the supply side of businesses instead of focusing on the demand side, where it is undoubtedly very strong. Another facet is the need to staying perceived as the innovator of the industry. This one is particularly important as it helps Salesforce command premium prices, which keep it profitable. While, from a customer experience point of view one cannot go around Salesforce, the company’s low profitabilty is an achilles heel that the competition does attack and will continue to do to. In order to not run into the risk of getting sidelined, Salesforce needs to continue playing its strength in innovation while improving on its profitability – without increasing prices. Salesforce is sitting on the throne that the other three companies are after. However, it is not a stable position. Salesforce owns the definition of CX, but it is dangerously limited in its scope. Looking at the big four, Salesforce for SAP and Microsoft is the enemy’s enemy, that keeps them in a carefully balanced alliance … which probably gets instable if Salesforce shows signs of being dethroned – by either Microsoft or SAP. Having said this, I do not see Oracle as being one of the top three vendors, rather a number four. This is in spite of its tremendous database force, which already is attacked, too. Oracle is lashing out at Amazon, both Microsoft and SAP have Salesforce in their sights, for time being. The company that should get into the sights of everyone else is Microsoft. Microsoft has all it takes to become the number one, including the most compelling strategy for small and emerging companies. Then we see some smaller players like e.g. Freshworks or Zoho that have the chance of disrupting the big players from below. But is this a fixed outcome? Not by far. All these companies are playing their strengths. And then we have the big infrastructure players, too. Amazon, Google, and Alibaba. And then there is Apple. These companies, plus the likes of Facebook and Netflix, sit on the one commodity that becomes more valuable by the minute: Data. Alea iacta est! Non tacitus!